WordPress is divided into two segment which are WordPress.com and WordPress.org this two platform are similar to Google blogger but has it own separate links so for you to be able to acess. The creation of a WordPress website or blog is somehow confusing because most newbies have this thinking of creating the blog before buying a domain which is not possible in WordPress.org but you can use WordPress.com to create a free one. Steps on how Export the files of your WordPress.com site. Then log in to your dashboard. Now click Tools >> Export. Then Download the XML (WXR) file to your local computer. Then on your left-hand navigation menu, click Tools> Import>WordPress. Now in the browse box, navigate to the export file that was downloaded to your local computer. Then click the Upload & Import File button. 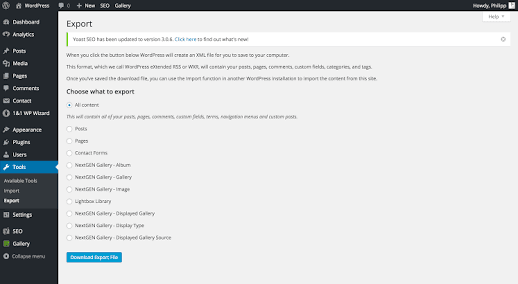 When all the files have been imported, just refresh your wordpress site to view the newly imported contents. Interesting. Wordpress dosn't give full supports until som1 upgrade to their plan even though, their plan are extremely cost. Well, Thats perfect, moving to another host is the best. posts. In any case I will be subscribing for your rss feed and I'm hoping you write again very soon! Normally I don't read article on blogs, but I would like to say that this write-up very pressured me to take a look at and do it!